Big Bunsby Marine Provincial Park was established to focus recreation use away from the adjacent Checleset Bay Ecological Reserve, located on the west side of Gay Passage. Accessible only by boat, this marine park offers sheltered anchorages and excellent sea kayaking opportunities. Big Bunsby, the largest of the Bunsby group of islands, is also a good place for nature viewing—gray whales, Bald eagles and the endangered sea otter all reside in the area. Low tides create tide pools that offer great opportunities for visitors to observe the local inter-tidal marine life. Please look but do not touch when viewing this sensitive environment. Although there are no developed campsites at this park, boaters and kayakers seeking a wilderness experience will find plenty of places to set up camp on Big Bunsby. Boaters should be aware of exposed and submerged rocks, which make navigation a challenge in the Checleset Bay area. There is no boat launch in the park. The nearest boat launches are at Fair Harbour and Artlish. 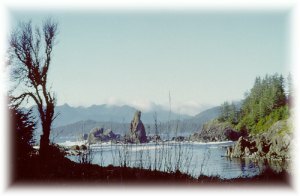 The park is situated on the west coast of northern Vancouver Island, about 30 km southwest of Port Alice. Access is by boat only. The most popular way to reach this park is via Kyuquot Sound. The nearest boat launches are at Fair Harbour, approximately 1 hour past Zeballos, and Artlish, approximately 1.5 hours past the Zeballos turnoff on Hwy 19. Boaters can reference marine chart #3682 (Kyuquot Sound) and #3683 (Checleset Bay) for more information on this area. Cultural Heritage: The park is located with the traditional territory of the Kyuquot/Checleset First Nation peoples. First Nations reserves located within the Bunsby Islands are not for recreational use. Visitors are encouraged to contact the Kyuquot/Checleset First Nation band office in Kyuquot prior to exploring the Bunsby Islands. Wildlife: The area is home to the rare sea otter. World-class kayaking and canoeing opportunities exist around the Bunsby Islands in the Checleset Bay Area. Brooks Peninsula Provincial Park is within a day's paddle of Big Bunsby. The sheltered waters around the park make the area an excellent place to sea kayak or canoe. Sea otters, gray whales, sea lions, seals and marine birds are common sights for kayakers paddling around this unspoiled wilderness. Although the Bunsby Islands are relatively sheltered, the access from Kyuquot to the Islands is exposed to rough seas and extreme weather conditions at times. Kayakers should be aware that winds can pick up quickly in this area, as can rough water, and should always practice caution. Kayakers should always take the ebb and flow of tides into consideration and be prepared for heavy fog at any time. Most kayakers launch from Fair Harbour, although the use of water taxis is becoming more and more popular as a method of quickly reaching the park. Water taxis can be found in Kyuquot and Zeballos. Saltwater fishing is extremely popular in this marine park, particularly for salmon, although rock fish and halibut can also be caught. All anglers should check the current regulations issued by Fisheries and Oceans Canada prior to fishing. Anyone fishing or angling in British Columbia must have an appropriate licence. There is no designated swimming area at Big Bunsby Provincial Park. There are no lifeguards on duty at provincial parks. Any ocean swimming will be cold. There are no developed campsites at this time;, however, visitors will be able to find user-created areas to camp throughout the park. There is no fee for wilderness camping. This park is accessible year-round; there is no fee for winter camping. This park is accessible year-round; there is no fee for winter camping.